Conan O'Brien may have missed his calling. The once and future late night television host laid down a scorching rockabilly-flavored set Thursday night at Jack White's Third Man Records and plans to release a vinyl album of the show. "This is probably the most fun I've had in show business," a sweat-soaked O'Brien told a crowd of about 300 before launching into a fiery finale of Eddie Cochran's "Twenty Flight Rock" with White. 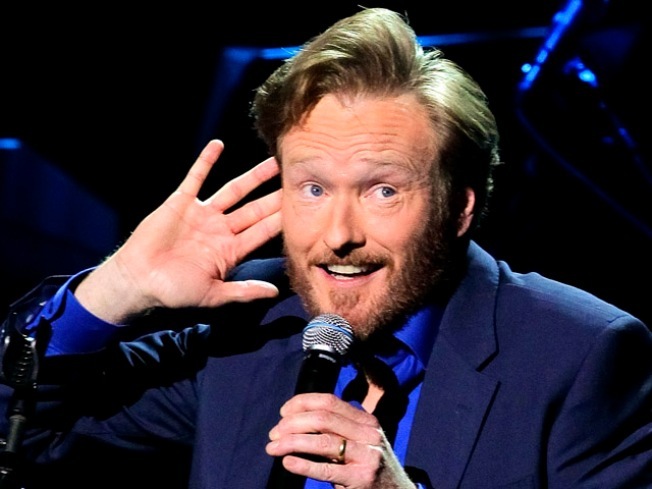 O'Brien has been riding a bus around the country with his band on "The Legally Prohibited From Being Funny On Television Tour," a music- and comedy-filled variety show, while waiting for his new hosting gig at TBS to start. He left "The Tonight Show" earlier this year after NBC reinstalled former host Jay Leno. O'Brien ripped through a rockin' set with his ace band behind him and The Cocettes singing backup. White, the leader of The White Stripes, The Raconteurs and The Dead Weather, introduced O'Brien as "a rockabilly legend in the making." White's Third Man Records has a concert space as well as reel-to-reel recording equipment. O'Brien wore all black, his unemployment beard and a light blue Fender electric guitar. He was comfortable and confident, using the kind of salty language you can't get away with on TV as he joked about himself, White and members of his band. He told the audience that in six months he's gone from hosting "the greatest franchise in television history" to touring the country in a bus to making a vinyl record. "I'm going back in time," he joked. "Next week I'll be playing Vaudeville and then I'm going to be a steamboat captain." O'Brien played it straight on about half his songs, leading the band through strong renditions of several classics, though he did add comedic lyrics to a handful of songs. He opened the set with Elvis Presley's "Blue Moon," burned through The Stray Cats' "Rock This Town" and laid a comedy routine about his middle class upbringing over Presley's "Poke Salad Annie." The redheaded host used The Redheaded Stranger Willie Nelson's "On The Road Again" to poke fun at his situation, singing, "My old show again/I just can't wait to get my old show again." He changed the next chorus to, "Off the road again, dear God please get me off the road again," before finishing the song with, "Thank you TBS for giving me a show." One of the night's highlights was his version of Radiohead's "Creep," which he sang with an exaggerated British accent. "This is the only way I can sing Thom Yorke songs, as a 19th-century chimney sweep with a top hat and a smudgeon my cheek," O'Brien said. A few bars in, White trotted on stage with a top hat, which O'Brien wore through the song. "That was so stupid," he said. Midway through the set O'Brien had soaked through his shirt and his hands were too wet to hold his guitar pick. His trademark curlicue widow's peak was a wild mess. O'Brien and White announced "something special" through Internet postings and a line of at least 1,000 people wrapped around the block and far up the street, even though only the first 300 were allowed into the show. O'Brien greeted the crowd when he showed up for soundcheck and White tossed bottles of water to fans from the roof of Third Man on a day when temperatures reached into the high 90s. The first people in line showed up 24 hours before the show, and the alley behind the studio had a party atmosphere, with beer bottles and pizza boxes scattered around. "This means everything to me. This was so cool," O'Brien said before leaving the stage to chants of "Coco, Coco!" O'Brien's next stop is Bonnaroo this weekend.